This is an amazing trip to Agra by fast Gatimaan Express Train from New Delhi. This is a perfect way to do same day Agra tour including transfers, city tour of Agra, buffet lunch at five star hotel during the tour etc. Tour does not operate on Friday as Taj Mahal is closed on Friday. Please find below the details tour itinerary for a day trip to Agra by train. You will be picked up from your hotel/residence in Delhi or NCR and transferred to Hazrat Nizamuddin Railway Station to board Gatimaan Express train to Agra. Pick up time is flexible depending upon where you hotel or residence is located. Train departs From Hazarat Nizamuddin railway station. Breakfast will be served in the train. Train arrives at Agra railway station. Upon arrival in Agra, you are met with company’s representative and introduction of Guide. Later proceed towards the guided city tour of Agra starts. The eighth wonder of the world, is the mausoleum of the Mumtaz Mahal and also one of the great architectural marvels in the world. An ideal epitome of love and dedication, the Taj Mahal was built by the fifth Mughal Emperor, Shahjahan in 1630 after the death of his beloved Mumtaz Mahal while delivering the child. It is quite unique as it is the only shrine in the world that has created a hallmark in the whole world. Taj Mahal leaves the tourists coming to Agra spellbound. In 1612, the marriage of Shahjahan and Mumtaz Mahal took place. She conceived fourteen children and while giving birth to the fifteenth child she took her last breath. By the hard labour of twenty thousand workers, the Taj Mahal was built in 22 years. The Red Fort in Agra stands on the banks of the river Yamuna making itself quite dominant in the whole area. It was designed and built by Akbar in 1565.A.D., the Agra Fort is fortified by a 70-foot high wall. Within the precincts of Agra Red Fort is the beautiful Pearl Mosque and numerous palaces including the Jahangiri Mahal, Diwan-i-Am, Moti Masjid and Diwan-i-Khas. The fort is safeguarded by four gates and is enclosed by a double barricaded wall of red sandstone. Buffet Lunch will be provided at Hotel ITC Mughal. Later proceed towards Fatehpursikri an excursion site.Situated 40 km from Agra, the city of Fatehpur Sikri is an imperial city built by the Mughal Emperor Akbar between 1571 and 1584. The srchitectural grandeur of this deserted city cannot be described in words and one can only experience the aura of its magnificent edifices by seeing them. If you are looking for something that symbolizes the grandeur of the Mughals, Fatehpur Sikri is a must-see during your Taj Mahal tour in Agra. Later way back to Agra railway station, explore the city's markets, shops and culture at your own as you will get plenty of time to hang around. Drop in at Agra Cantt Railway Station to board on Gatimaan Express train to Delhi. Gatimaan Express train departs from Agra railway station. Dinner will be served in the train. Gatimaan Express Train arrives Hazarat railway station.Upon arrival Pick up from Railway Station and transferred to your hotel/residence in Delhi or NCR. *Entrances to monuments,camera fee etc. Day trip to Agra includes the visit of UNESCO world heritage sites such as Taj Mahal, Agra Fort and Fatehpur Sikri. If any one likes this and join the tour. Please e-mail at info@spholidays.com or watch out for this link – Same Day Agra Tour. Agra was once the erstwhile seat of Mughal Empire in sixteenth Century that is now a city of Taj Mahal located 200 km south of national capital of India, New Delhi. Agra is the most visited city in Uttara Pradesh due to Taj Mahal is located here, which is world’s most attractive marble building built by Mughal Emperor Shah Jahan with the help of 20000 workers labored for 22 years to complete the mausoleum. Taj Mahal is often referred as Symbol of Love or Epitome of Love because Emperor Shah Johan built Taj in the memory of his wife late Mumtaj that reflects the love Emperor had for his wife. Agra is home to three UNESCO world heritage sites namely Taj Mahal, Agra Fort and Fatehpur Sikri. 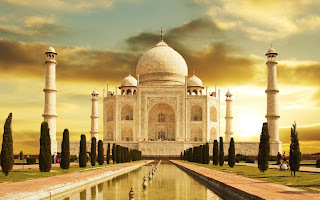 Taj Mahal is prime attraction in North India and also crowned as one of the Seven Wonders of the World. In Agra, one can enjoy piece of Mughal architecture and craftsmanship in monuments like Taj Mahal, Agra Fort, Sikandara and Fatehpur Sikri. Agra attracts millions of tourists every year due to having such monuments with great history behind them. Agra has beautiful markets dotted with marble factories and carpet shops that keep the travelers mesmerized. Hotels are easily available in Agra ranging from budget to five stars. Agra city is considered in every tour itinerary of India whether for first time travelers or repeaters. Coming on to architecture of Taj Mahal, Pietra dura had been extensively used as decorative patterns into the marble of Taj. The Florentine technique of Pietra dura is said to have been imported from Italy and later developed in Agra as Pachikari. Minute silvers of precious and semi-precious stones such as carnelian, turquoise and malachite were arranged in floral designs into the marble base. Emperor Shah Jahan called upon artisans and architects from different parts of the world and asked them to share their ideas of making this wonders a possible. Arranging semi precious stones with the help of mysterious glue after carving on the best of marble is a rare art. There was no mentioning of artisans in the history who contributed their skills to make it possible. Some artisans from nearby villages can still be seen working to save their ancestral art from the danger. Few artisans are left who know this art can be found working in same passion at various marble factories in Agra. Taj Mahal tour from Delhi is very popular now days as it covers all attractions of Agra in a day and also leaving some time out for hanging out the market as well. Traveler’s first choice to get Agra is by fast trains from Delhi that reaches Agra in 2 hours. Since Yamunna Expressway has been opened for public, traveling by road has become trend to visit Agra in a day trip. Same day Agra tour from Delhi is enjoyed by visitors like never before. Agra tour can be clubbed with nearby Bharatpur bird sanctuary which is a paradise for bird watchers.